Since 1997, there is a Swedish miniatures magazine, named Miniatyrvärlden (The Miniature World). 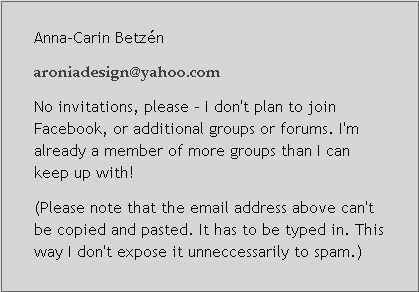 I've contributed DIY projects from time to time, as listed on this page. New entries will appear near the top of the page. Backdrop facades (I made them for my aunt's market scene). The how-to has measurements for 1:24, but can of course be adapted to other scales. Issue 2 contained the building how-to, and issue 3 the faux painted pantile roof. 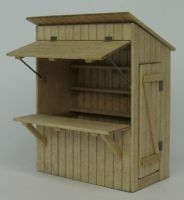 Plans for a 1:48 scale market stall, and generic building directions including how to enlarge the plans for larger scales. You'll find more pictures and facts on my market scene page. 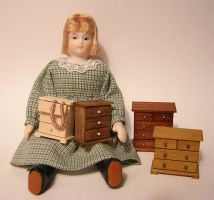 I built the antiques shop roombox for the magazine's 10th anniversary issue. 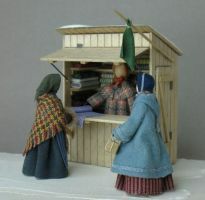 There I gave directions for building a shop counter and a cash register, plus hints for finding larger-scale accessories compatible with 1:48 scale. Visit the Antiques shop page for pictures. 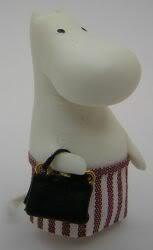 Moomin Mom's bag (any scale) - due to a mixup, the wrong photo was included. The correct photo, as shown here, appears in issue 2. 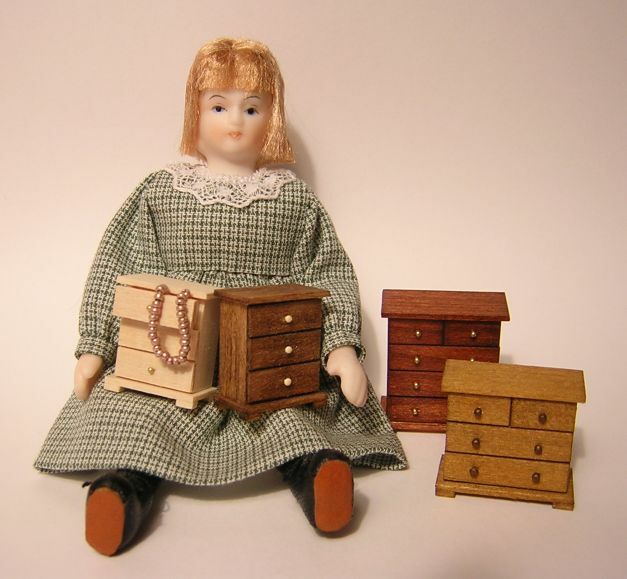 A 1:12 scale trinket or doll chest, that doubles as a 1:48 scale chest of drawers. There are a few different variations, as shown. None of the drawers open - the half-open drawer with the necklace hanging out is only a drawer front glued on spacers. One of the chests of drawers is now in my 1860s bedroom. 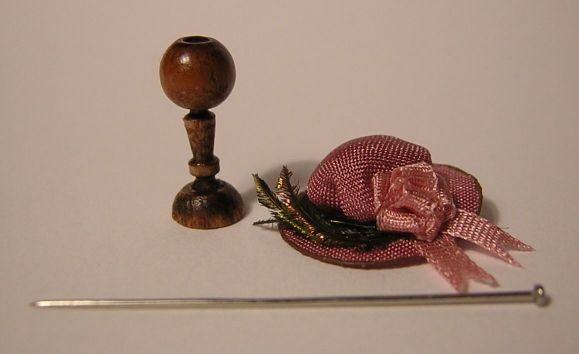 Hat stand and hat in 1:48 scale. A needlepoint chart based on William Morris' Little Tree carpet. 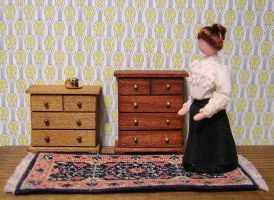 The pic shows two different uses for the same design - a 1:48 scale carpet stitched on silk gauze, and a 1:12 scale stair carpet stitched on 22 count canvas. 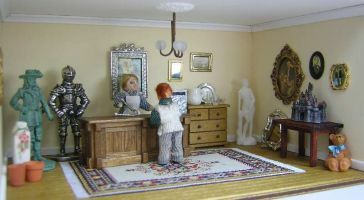 The 1:48 scale version is shown with a lady doll in the photo above. 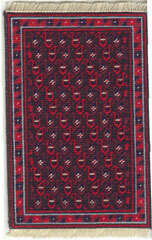 A 1:12 scale needlepoint rug I designed for 22 count canvas, based on an early 19th century Belouch rug. 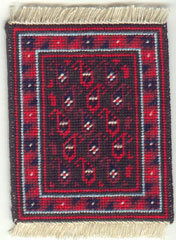 I stitched the small rug, which is 6.5 cm by 8 cm (2½" by 3"), and edited the image to show what a rug with more repeats could look like (10 cm by 15 cm, or 4" by 6"). Almost 10 years later, I re-charted it for 1:48 scale. 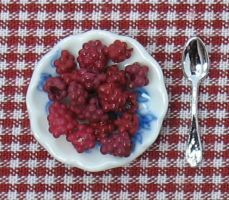 You can download my free charts for the 1:48 version on this page in the needlepoint section of my site. How-to's for my basic roombox (1:48 scale, of course!) 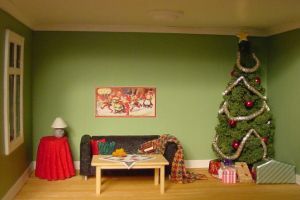 depicting a living room at Christmas time appeared in issue 3, 2002, which was published in December that year. Visit the Christmas living room page among my other roomboxes, for more and larger images. 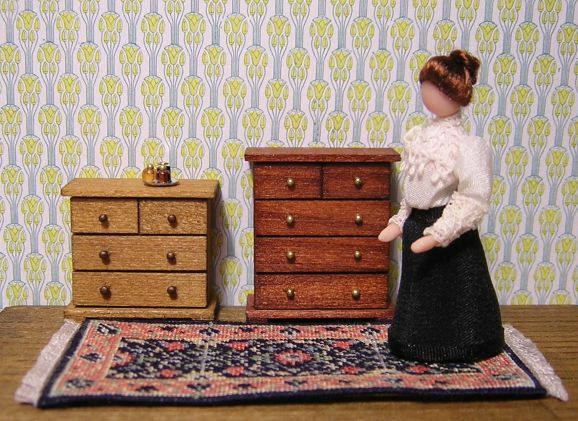 My directions for making a basic table and bed in 1:48 scale, that could double as doll furniture in 1:12 scale. Later I used the table in my antiques shop (above). These issues featured photos of my minis (no how-tos for them). The 1930s table setting was shown on the inside back cover. The cover had a photo of my 1860s bedroom. My arbor was shown on the inside back cover. 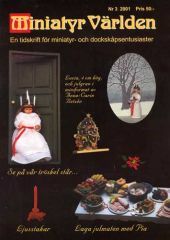 The Lucia and Christmas tree (both shown on the Swedish Christmas page) appeared on the cover. The editors of Miniatyrvärlden visited me once, and wrote two articles that appeared in consecutive issues. The first one featured my English Cottage and Florida Art Deco house; the second one my H0 scale Moomin house.